These are lyrics by KoRn that we think are kind of repetitive. They say it exactly 21 times (though not in a row) throughout the song. 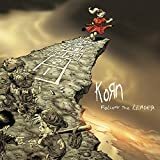 KoRn's, "Y'all Want A Single (Say F*** That)"
It throws the 'F-bomb' exactly 99 times throughout the song.